Mechanical Zingers are purple and yellow robotic Zingers found only in Donkey Kong 64. 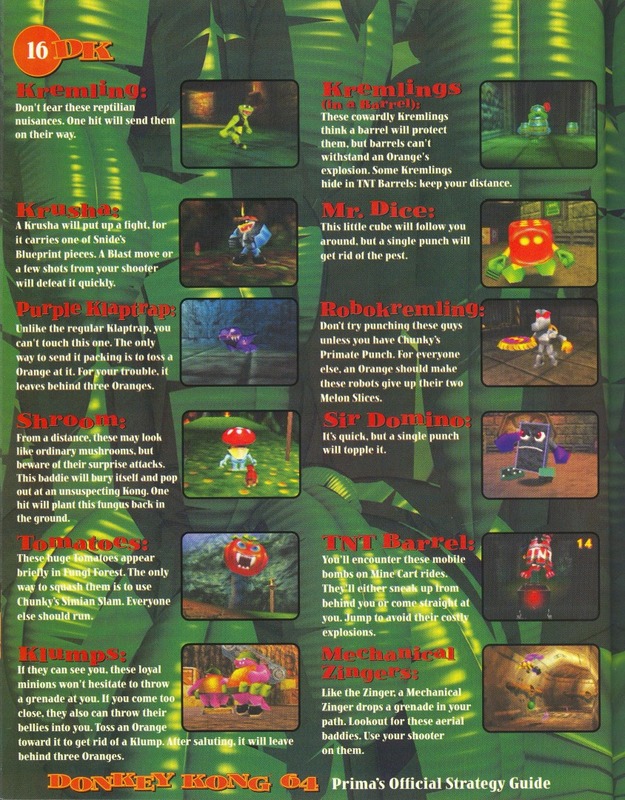 Mechanical Zingers are found exclusively in the third world of the game, Frantic Factory as common enemies. They also have a brief appearance in one of Lanky Kong's minigames in Hideout Helm, where he must shoot down three of them. Mechanical Zingers, like normal Zingers, will attack the Kongs by dropping unripened, green Orange grenades on them. Mechanical Zingers are also slightly more durable than their organic counterparts, requiring two shots from a weapon instead of one to defeat it. The first shot does cause them to fly erratically and start smoking and they can still be defeated in one hit from Chunky Kong's Pineapple Launcher, however. An Orange grenade or a Kong's musical instrument are also capable of defeating them in one hit. Unlike normal Zingers, Mechanical Zingers do not attempt to dive-bomb the Kongs. Mechanical Zingers do not have wings; instead, they have propellers like a helicopter. They also have wheels instead of legs, and they drop their oranges from a hatch. This page was last edited on August 26, 2018, at 22:19.